"This Riad gives you a true Marakech experience. You are just out of touristic area, but still in the vivivant medina. Also download the APP from Triposo called Marocco..it will bring yu home on an offline GPS.."
"The riad is just great, well furnished and conveniently positioned in the less crowded area of the Medina. Our room at ground floor enjoys a beautiful private bath facing a huge palm tree in the middle of the courtyard. The owner is very kind and full of attention to the guests"
"We loved this Riad! 4 Bedrooms with plenty of living space. We were 4 women travelling together and stayed for 3 nights, so it was nice to have a home to stay in. The service on arrival was great and we were well looked after.Fantastic Value too for the centre of Marrakech.Thanks for a great stay!" 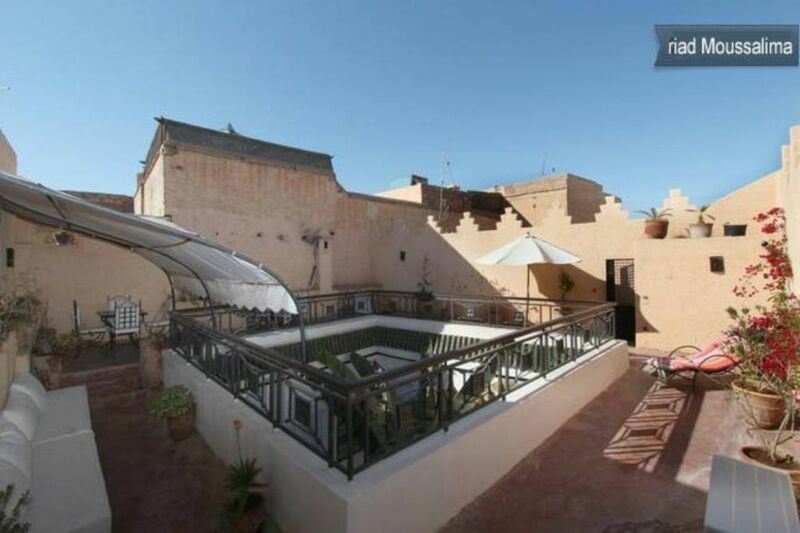 "A very nice and beautifully decorated Riad in a quiet northern part of the medina. In the morning you will hear and see birds on the terrace and hardly any city noices. The bikes that are there for use for all are great to explore the city. The location is perfect and the service is excellent. Great breakfast and cooking provided too. All together i would recommend this riad to anyone who would like to spend time in Marakesh. The caretaker and the owner are both very very helpful and nice, we had a great stay there and we will come again soon." Nous avons passé un très bon séjour dans ce riad ! Les différents escaliers font de ce lieu un endroit surprenant et agréable. Que dire de Latifa, que j'ai rebaptisé Queen Latifa (chanteuse) dont les mets sont équivalents à la qualité de la chanteuse (pour les initiés) ! Bref, c'était très très bon !! Ce qui est bien avec cet endroit, c'est que l'on est dans Marrakech...et pas que le côté touristique. Een hele ruime, goed verzorgde woning. Gunstig gelegen om de medina te verkennen. (Text automatically translated) Accessible by car, the riad is located in the old quarter of Zaouia, taxis to 200 m. Parking on the neighborhood. (Text automatically translated) Restaurants, hammams spas, swimming pools, discos. Visit the souks and monuments, El Badi Palace, Bahia Palace, Dar Si Said, Ben Youssef Madrasa, Jardin Majorelle, Agdal, Menara. Palmeraie Royal Golf and Golf Amelkis 5 minutes by taxi. Trips to Ourika, Essaouira, desert, etc ... There is a nice patio pool to cool off and shower on the terrace for the summer season and we have an address pool restaurant at unbeatable value for money for a fantastic day out, a real paradise.